Electrical equipments are not working even though inner panel and engine compartment fuses are not blown, or many of these are not working at the same time, it may has blown the main fuse(Battery Fuse Terminal type) inside of the battery(+) cap. After checking the main fuse, install the cover securely when you close the cover, check the locking sound. If not, electrical failures may occur from water leaking in. 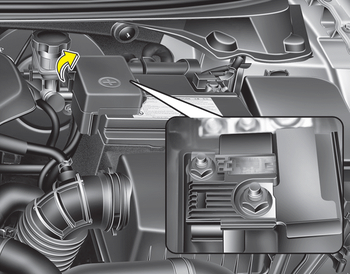 Visually inspect the battery cap for secure closing. If the battery cap is not securely latched, the electrical system may be damaged to due influx of moisture into the system.